Star Wars fans were introduced to a variety of new characters in the recently release Star Wars: The Force Awakens. While there were many new faces to find out about and some old friends to get reacquainted with, fans of the feature film took to Rey with the most sincerity. 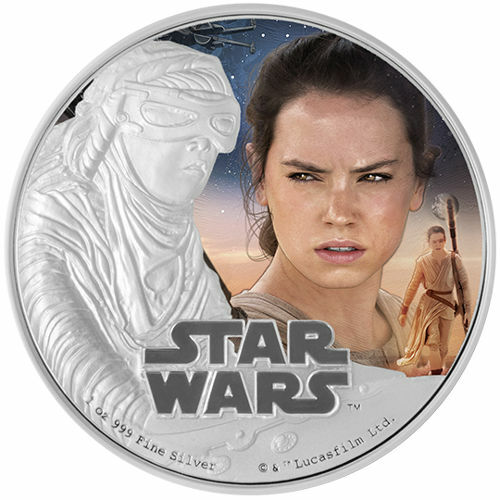 Today, Silver.com offers the 2016 1 oz Silver Niue Star Wars Rey Coin for sale. Total mintage capped at just 10,000 coins. 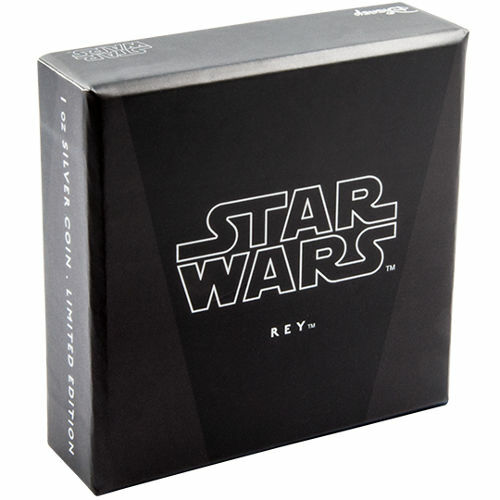 Third release in the new Star Wars Force Awakens series. Ships in a plastic case to protect the coin, with a feature-film themed shipper. 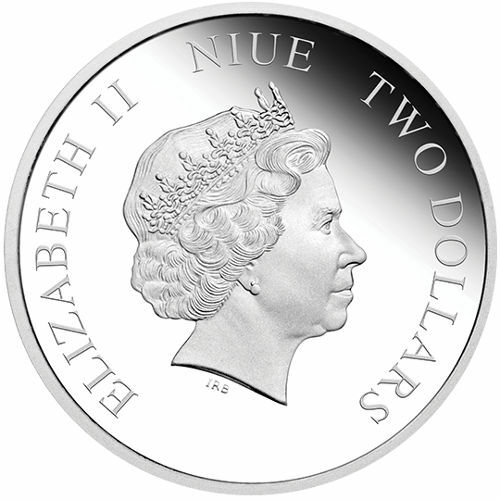 Face value of Two Dollars is considered legal tender in Niue. Reverse features images of Rey. Obverse depicts Queen Elizabeth II, longest reigning monarch of Britain. The last time a new trilogy of Star Wars films were released, the world was left unimpressed. However, they quickly forgot about those failed prequels with the release of the first of three planned sequel films in a new trilogy. Star Wars: The Force Awakens takes viewers to a world where the Empire is dead, but a new evil is rising in its place. A whole new cast of characters joins a few familiar faces from the original series of films, and leads viewers on an intense chase to unravel what is going on in the universe. Rey is the franchise’s new heroine, a wanderer who hasn’t quite discovered her unique abilities when you first meet her. 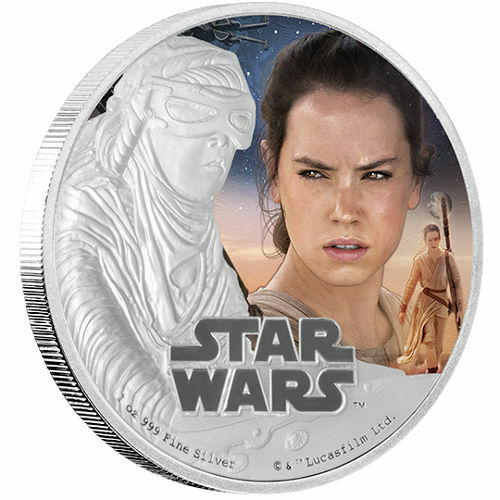 The reverse of each 2016 1 oz Silver Niue Star Wars Rey Coin features two colorized images of Rey. In one image you see her piercing eyes gazing off at something in the distance, while the other colorized film shows her walking the dunes of Jakku. A third, silver image of Rey shows her riding her sand speeder with protective cloth to prevent dust and sand from getting into her eyes. On the obverse of the coin is the image of Queen Elizabeth II. A standard feature on commonwealth coinage, this image from Ian Rank-Broadley is the fourth-generation of Her Majesty used on coinage. New Zealand Mint operates a private facility in Auckland, New Zealand, where it is the only minting operation in the country. These 2016 1 oz. 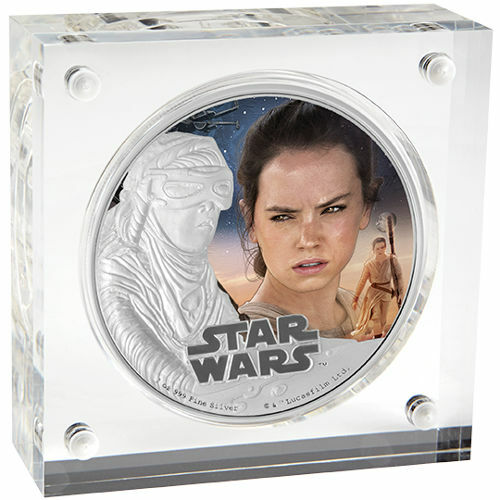 Silver Niue Star Wars Rey coins are one of three in the Star Wars Force Awakens series, and separate from the exciting Star Wars Classic series. If you have questions, contact Silver.com at 888-989-7223. You can also reach us online using our live chat and email services. To see similar items, visit our New Zealand Silver Coins page.